My name is Katie and I’m a senior at the University of Delaware, sadly awaiting the day no one wants to mention… graduation. Spring semester of senior year has, so far, consisted of anxiety about jobs, applications, relocation and interviews, but thanks to Margaritaville, also has some fun mixed in! The Margaritaville University College Ambassador Program has not only changed my college experience and my whole life in the past two years, but has also given me practical, real-life marketing experience that I can now talk about in detail during job interviews. The Margaritaville Team works with us every day to ensure that we get the most out of the program while we are still “enrolled,” and that we can take the skills we’ve learned with us after graduation. There are more than 200 ambassadors currently enrolled in the program, which means not only do we instantly have a great network of friends and professionals across the country, but we are also in friendly competition against one another to be the best at spreading the escapism vibes on our campuses. To be a bit more technical, I’ve really had to focus on the target audience and consider different approaches for marketing this program to them in an effective way. I said that exact sentence in a phone interview recently, and my interviewer was pretty impressed. One of my favorite parts of the program is the ability to think of creative ideas to stand out and then make these ideas come to life! For example, Margaritaville donated a Frozen Concoction Maker to me as part of a raffle basket for my sorority’s philanthropy event that 200-plus UD students attended. They all saw the blender and other Margaritaville products such as hats, flip flops, a flag, drink koozies, and stickers, and couldn’t wait to learn more about how to get involved with the program and get their hands on some of the awesome products! Another thing I consider while spreading the Margaritaville state of mind is how to both entertain and educate students about the brand. 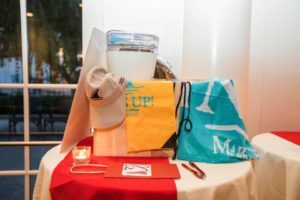 In one instance, Margaritaville donated a Frozen Concoction Maker and several Margaritaville Foods products to be used in a healthy cooking series with the Student Health Services. Once a week, these products were used to show students how easy it is to make healthy food with a tropical twist! 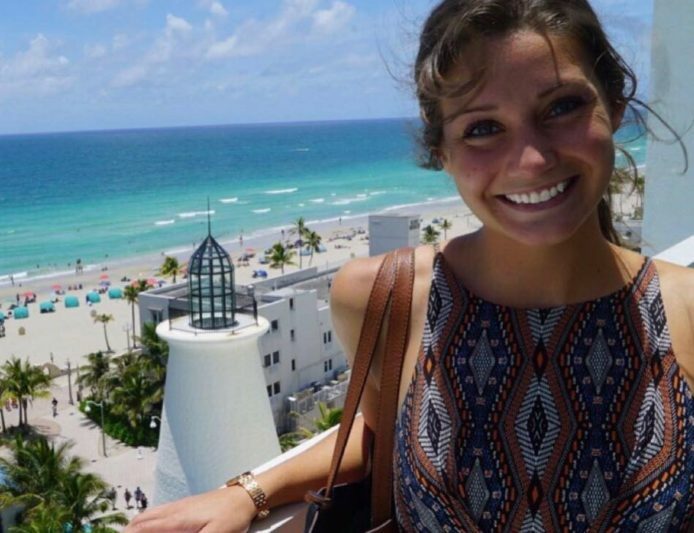 And to top it off, I was lucky enough to earn a spot as a top ambassador and was invited to attend the Inaugural Margaritaville College Ambassador Roundtable at the Margaritaville Hollywood Beach Resort in Florida last summer. 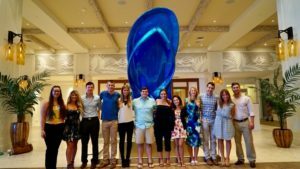 The time there was spent with 7 other ambassadors and the Margaritaville University Team, working together to expand and improve the college ambassador program with a little help from a student’s perspective! This experience in particular helped me develop marketing and sales skills and effective ways for me to explain ideas that I had for the program. I also was able to explain why my experience as a student could benefit these meetings and brainstorming ideas because we are students marketing to other students our age. These few days in Hollywood Beach were not only fun and rewarding, but they also gave me the professional experience and in-person networking that are crucial as a graduating senior. These ideas don’t come easy, so I truly had to challenge myself to be the most successful I can be. Reaching the most students possible on a campus that has over 15,000 people has taught me more about how I can excel at marketing and targeting a specific population than my traditional desk-bound internship. Now that I am going into full-time job interviews, I know that I can blow any interviewer away with everything that I have learned from Margaritaville University and I will, no doubt, use these skills in my professional future.